Hey friends! 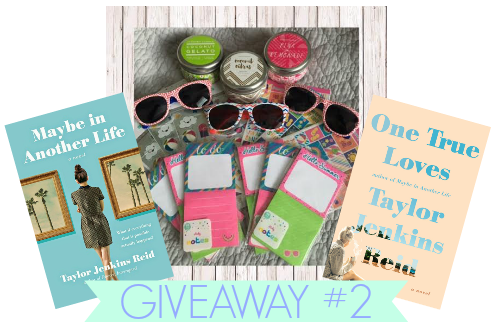 We're right in the middle of my Sweet Summertime Reads feature, so I thought it would be a good time to kick off Giveaway #2!! This round of goodies involves two books by the same author: Maybe in Another Life and One True Loves by Taylor Jenkins Reid. Both of these books are perfect for a summer day of reading by the pool, or at the beach. I found myself getting lost in their stories and want to share that with another lucky reader as well. One winner will receive both books + more summer goodies pictured below. This giveaway is open to US and Canada residents only. Good luck! Be sure to follow the #SweetSummertimeReads hashtag on twitter & join the #SweetSummertimeReads2016 photo challenge on Instagram for more summer fun! I loved seeing your pictures...I definitely want to do the PCH and Big Sur at some point. A dream vacation for me would be Switzerland or Scotland. I also want to go back to Hawaii. Thanks for the great giveaway! Ireland!!! My dream vacation is to go there!!! I would love to travel and visit Europe. I would love to see some historical sites. A castle tour of Scotland is on my bucket list. Australia. Every year I watch Aussie Open tennis tournament on television, and the camera always swoops in on all these gorgeous vistas, so I'd love to see it for myself someday. Iceland is currently at the top of my list. I would LOVE to go to England!! Or Spain. Or Germany. Or anywhere, really. I've never been out of the USA, and don't even have a passport. I'm hoping to study abroad in a few years, though! Greece is the top of my list! I would like to visit Alnwick Castle and pretend that I'm at Hogwarts! Mu bucket list is the national parks mostly yellowstone. I would love to see it. OH there are so many places on my travel bucket list, so hard to pick!! I think I will go with Ireland... It seems like it would be such an amazing place to visit!!!! I'd like to visit France. I would absolutely LOVE to go to Italy! It's on my bucket list. I want to eat all the food! I would love to go to Greece. It looks so beautiful there. London is on my bucket list but I'm finally going in September. A place that I don't know WHEN I'll visit would be Italy. I'm sure I'd eat my weight in food though.